Homeless activists seek to tap into the long protest tradition that CCNV spearheaded in the 1970s and 1980s. 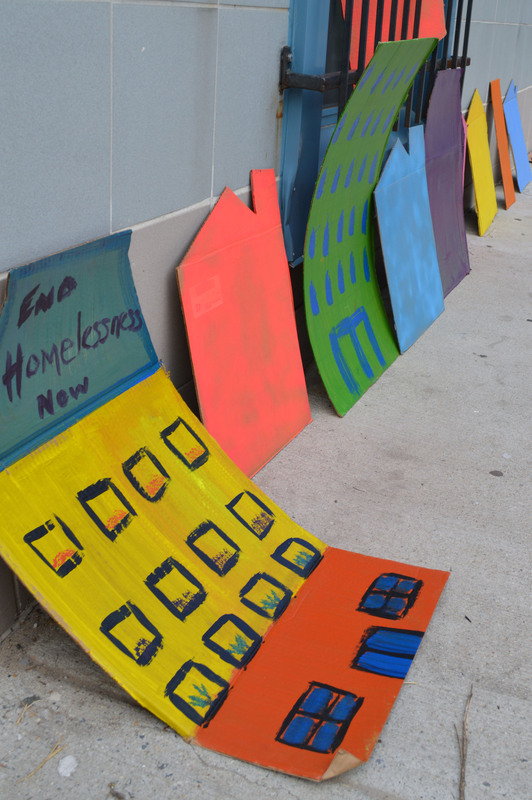 Placards outside the Federal City Shelter at a voting rally on April 13, 2013 organized by Shelter Housing and Respectful Change (SHARC). Image used with permission, courtesy of Claire Davis. After a long and determined struggle led by the Community for Creative Non-Violence, on July 7, 1986 the federal government turned over the Federal City Shelter building to Washington, D.C. This transaction occurred at the peak of the city’s influential and trailblazing movement to end homelessness led by the iconic Mitch Snyder. Nearly thirty years later, the hopes to end homelessness have dissipated as the dramatic changes in the city have left more and more people without housing. With the thirtieth anniversary looming, we stand at a moment of challenge and opportunity as we try an envision the way forward. What will happen to the downtown shelter as the city’s obligation to use the building for homeless services lapses? On one hand, as the redevelopment of downtown moves eastward, there are significant pressures to disperse the unhoused from the center of the city. On the other hand, the anniversary offers a moment to re-envision what our city could look like if all its residents had access to housing. This site will not have the answers, rather it seeks to raise questions by looking back in time. The issues and tensions we are faced with now are not new. In fact, as our research has uncovered, the construction of the very building currently housing the shelter led to the displacement of the remnants of a black working-class alley community that existed on the site until 1940. For nearly one hundred years, there have been efforts to move the poor from the core of the city that have been countered by struggles to resist this dispossession. Rather than being unwanted guests downtown, the impoverished have a long term claim to the space. These stories are told in the pages here. We do not have to repeat these patterns moving forward. In fact, we would be well advised not to. Perhaps the most significant way we could avoid the mistakes of the past is by carefully listening to those who are experiencing homelessness and asking them how we can meet their needs. And for those of us who are without housing, we need to play an active role in making sure our voices are heard.